AIMS To examine the association of direct (e.g. hitting) and relational (e.g. hurtful manipulation of peer relationships) bullying experience with common health problems. METHODS A total of 1639 children (aged 6–9 years) in 31 primary schools were studied in a cross sectional study that assessed bullying with a structured child interview and common health problems using parent reports. Main outcome measures were common physical (e.g. colds/coughs) and psychosomatic (e.g. night waking) health problems and school absenteeism. RESULTS Of the children studied, 4.3% were found to be direct bullies, 10.2% bully/victims (i.e. both bully and become victims), and 39.8% victims. Direct bully/victims, victims, and girls were most likely to have physical health symptoms (e.g. repeated sore throats, colds, and coughs). Direct bully/victims, direct victims, and year 2 children were most likely to have high psychosomatic health problems (e.g. poor appetite, worries about going to school). Pure bullies (who never got victimised) had the least physical or psychosomatic health problems. No association between relational bullying and health problems was found. CONCLUSIONS Direct bullying (e.g. hitting) has only low to moderate associations with common health problems in primary school children. Nevertheless, health professionals seeing children with repeated sore throat, colds, breathing problems, nausea, poor appetite, or school worries should consider bullying as contributory factor. Approximately 8–46% of children1-4 experience being bullied in primary school. Adverse effects of peer victimisation on psychological maladjustment such as anxiety, depressive feelings, low self esteem, or loneliness have been found in studies of predominantly secondary school children.5-7 In contrast, there is a dearth of research on the relation of bullying experiences and common health complaints8 and school absenteeism. Williams et al found that 9–10 year olds who reported common health problems such as tummy aches or sleeping problems also reported being victims of bullying two to four times more frequently.8 However, as the informants on bullying and health problems were the children, often in the presence of their parents, the effects may have been inflated.5 There may be a tendency for victims to exaggerate adverse effects.7Recent research indicates that a proportion of victims are also bullies at other times (bully/victims2 4 9) and have been reported to differ significantly from “pure” bullies in their behaviour.10-12 They should be considered separately from pure victims or pure bullies. Finally, little is known about the adverse effects of more subtle forms of victimisation on common health complaints involving the hurtful manipulation of peer relationships and friendships, often called relational bullying4 13 14compared to direct bullying comprising physical (hitting) or direct verbal (threats) aggression. We investigated the association of bullying involvement among 6–9 year old primary school children, assessed with a structured private interview by postgraduate psychologists, to parent reports of common health complaints and school records of school absenteeism. All 2201 children and their parents in 78 classes in 31 primary schools were approached for consent. For 107 children (5.4%) parents declined permission and a further 112 (5.7%) were not present on the days of interviewing. Total participation rate for the interviews was thus 88.9% (n = 1982). The age ranged from 6 to 9 years with an average age of 7.6 (SD 1.0) years (year 2: 6.7 (SD 0.6) years; year 4: 8.3 (SD 0.6) years). A total of 51.4% were male and 49.6% female; 8.9% of children were from ethnic minorities. Ethical approval for the study was granted by the University of Hertfordshire Ethical Committee. Children were individually interviewed between 1996 and 1998 using a standard bullying interview complying with the criteria stipulated by Olweus.15 It consisted of six questions about direct bullying experiences at school, four questions relating to relational bullying at school, and two questions about whether the children had directly or relationally bullied other children in the last six months.10 Frequency of bullying experience was rated in three categories: not at all/seldom (one to three times during half a year), frequently (more than four times during half a year), and very frequently (at least once a week). Parents completed a health questionnaire with two sections: (a) seven items about physical health problems (PHP) over the previous six months rated on a seven point scale (none to six or more times) (headache, tummy ache, sore throat/ear ache, cold/cough, feeling sick, breathing problems, skin problems); and (b) seven items about psychosomatic health problems16 (PsHP) rated according to a five point scale (never to most days) (bed wetting, problems going to sleep, nightmares, woken in the night, poor appetite, excessive appetite, worried about going to school). Furthermore, parents were asked whether they ever felt that the child made up illnesses (never versus sometimes to often). School absenteeism data were obtained from parent reports and the school register for the previous six months. According to the interview, children were classified into the following groups1 4 for direct bullying and relational bullying, separately: bullies (B) (children who were involved in bullying others frequently or every week but are never or only seldom victimised); victims (V) (children who experienced victimisation frequently or every week but bully others seldom or never); bully/victims (B/V) (children who both bully others and become victims frequently or every week); and neutrals (N) who neither bully others or become victims (never or seldom only). Analysis was carried out using SPSS/PC (version 10). Dropouts were compared to participants using cross tabulations.17 Item distributions of the PHP and PsHP were skewed. To gain a more symmetrically distributed total PHP and PsHP score, each rating of two or more times occurrence on each item in the previous six months was assigned a value of 1. PHP and PsHP item scores were then totalled separately. Differences in total physical (PHP) and psychosomatic health problems (PsHP), and bullying classification (independent factor levels: B, B/V, V, N) were analysed using one way analysis of variance for direct and relational groups separately. Contrasts were computed using a posteriori Tukey–HSD test. Logistic regression analysis (all independent factors entered at the same time) were carried out to determine best prediction of highly increased total PHP and PsHP scores defined as the number of health problems above the 90th percentile (PHP: more than four symptoms; PsHP: more than three symptoms) and school absenteeism above the 90th percentile (parental: more than nine days; school register: more than 11 days). Predictor variables were: (a) relational bullying status (reference category: neutrals); (b) direct bullying status (reference category: neutrals); (c) gender: girls versus boys; (d) age: year 2 versus year 4; and (e) ethnic minority: ethnic minority versus white English. Of the 1982 children who had interviews, 1639 parents returned the health questionnaire (82.7% return rate). No differences between participants (n = 1639) and dropouts (n = 343) were found according to school year or ethnicity of the children (table 1). However, slightly more parents of girls than boys returned questionnaires (<2% difference) (χ2 (1, n = 1982) = 11.59, p < 0.001; table 1). Table 2 shows the prevalence of children who were involved in bullying. Significant differences between direct bullies, victims, bully/victims, and neutral children and total physical health symptoms were revealed (F (3, 1561) = 4.18, p < 0.01; fig 1). 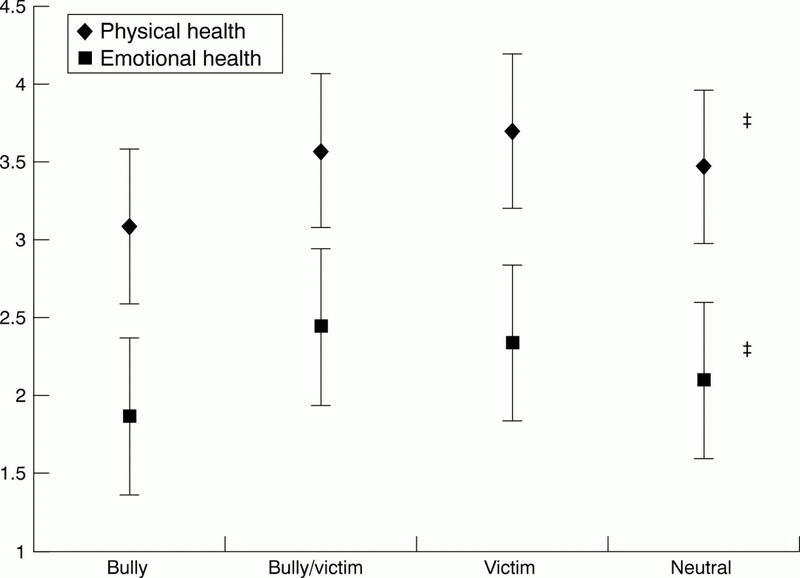 A posteriori contrasts (Tukey–HSD test) indicated that victims had significantly more physical health problems than bullies (p < 0.05) and neutral children (p < 0.05) but were not different from bully/victims (victims: mean 3.70, 95% CI 3.58 to 3.83; bullies: mean 3.08, 95% CI 2.63 to 3.53; neutral: mean 3.47, 95% CI 3.35 to 3.59). Average total health problems for children involved in direct bullying. Significant differences for direct bullying groups on total psychosomatic health symptoms was found: (F (3, 1628) = 5.03, p < 0.01; fig 1). A posteriori contrasts (Tukey–HSD test) indicated that direct victims (p < 0.05) had significantly more psychosomatic health symptoms than neutral children (victims: mean 2.34, 95% CI 2.22 to 2.46; neutral: mean 2.10, 95% CI 1.99 to 2.21). No differences between involvement in relational bullying and total PHP and PsHP scores were found. Children who were involved in both types of bullying behaviour—that is, direct bullies, bully/victims, or victims, and also relational bullies, bully/victims, or victims (n = 499–517, some missing scores for PHP) were compared with children who were not involved in either type of bullying—that is, direct neutrals and relational neutrals (n = 510–531), children who were involved in direct bullying only (n = 349–365), and children involved in relational bullying only (n = 510–531). No significant differences between involvement in both types of bullying behaviour on total physical health symptoms (PHP) was found (F (3, 1560) = 1.29, p = 0.28) (both types of bullying involvement: mean 3.62, 95% CI 3.47 to 3.76; direct only: mean 3.65, 95% CI 3.48 to 3.83; relational only: mean 3.47, 95% CI 3.24 to 3.70; neutral: mean 3.47, 95% CI 3.32 to 3.61). In contrast, significant differences between involvement in both types of bullying behaviour on total psychosomatic health symptoms (PsHP) was found (F (3, 1627) = 3.44, p < 0.05). A posteriori contrasts (Tukey–HSD test) indicated that children involved in both direct and relational bullying had significantly more psychosomatic health problems than neutral children (p < 0.01) (both types: mean 2.36, 95% CI 2.22 to 2.50; direct only: mean 2.27, 95% CI 2.11 to 2.43; relational only: mean 2.20, 95% CI 1.99 to 2.41; neutral: mean 2.06, 95% CI 1.92 to 2.19). The logistic regression model for predicting high physical health problems was significant (χ2 (9, n = 1560) = 19.65, p = 0.02; table 3). Girls (adjusted odds ratio 1.39, 95% CI 1.12 to 1.72), direct bully/victims (adjusted odds ratio 1.62, 95% CI 1.09 to 2.43), and victims (adjusted odds ratio 1.34, 95% CI 1.05 to 1.70) were most likely to have high physical health symptoms (PHP). The full model for predicting high psychosomatic health symptoms (PsHP) was also significant (χ2 (9, n = 1627) = 23.09, p = 0.006; table 4). Direct bully/victims (adjusted odds ratio 1.55, 95% CI 1.02 to 2.36), direct victims (adjusted odds ratio 1.39, 95% CI 1.07 to 1.80), and year 2 children (adjusted odds ratio 1.32, 95% CI 1.05 to 1.66) were more likely to have a high level of psychosomatic health symptoms. To determine which individual health symptoms were more frequently reported by parents for direct victims or bully/victims, the individual physical and psychosomatic health items were dichotomised: if repeated symptoms in the last six months were experienced by less than 10% of the total sample (item score >90th percentile), the health problem was considered as clinically significant. Table 5 shows the significant cross tabulations between bullying group and clinically relevant health symptoms. Direct victims and bully/victims had significantly more often repeated sore throats, colds or coughs, breathing problems, nausea, and poor appetite. They were also more often worried about going to school and were more likely to make up illnesses to stay at home during school days. Our results indicate that direct and relational bullying behaviour are widespread at primary school age. Direct bullying victimisation, but not relational bullying was associated to both physical and psychosomatic health problems, although the associations were weaker than previously reported by Williams and colleagues.8 This is likely to be accounted for by methodological factors. Firstly, the interview carried out by school nurses was unstandardised and occurred during a routine health assessment.8 Secondly, children were the informants for both bullying and health problems recorded by school nurses.8 This is likely to have led to overestimations of the effects of victimisation on common health problems as noted in previous research on the relation between bullying experience and psychological problems.5 In contrast, in the present study children reported bullying in a highly structured standard interview and a different data source, the parents, reported on health problems; both parents and school records provided data on school absenteeism. However, despite the differences in strength of associations compared to Williams and colleagues,8victimisation is related to health problems at primary school age. “Pure” bullies (i.e. those children who do not become victims themselves at other times) have been reported to be either stronger4 19 or to have superior social understanding and insight of how best to manipulate and dominate other children.20 21 Victims are often smaller in height,22 and boys who are victims are often physically weaker19 than same aged peers. Findings here suggest that pure bullies are also healthier compared to victims or bully/victims and even neutral children. Pure bullies appear to have a constitution and characteristics that allow them be dominant in peer relations.4 5 Findings here and elsewhere also do not support the view that pure bullies are worried, depressed, or anxious individuals.7 10 11 23 Rather bully/victims and victims are at an increased risk for health problems as shown here. Those who become victims of bullying, including those who also bully at other times (bully/victims) are also at the highest risk for behaviour and psychiatric problems.10 11 In future research and clinical practice it is thus necessary to distinguish between pure bullies, versus victims and bully/victims. The physical or social cognitive21 advantages that “pure” bullies possess may be able to be channelled into more appropriate behaviours, for example, by providing a leadership role in peer support or sport activities rather than bullying. No association between bullying involvement and school absenteeism was found. This is in contrast to previous reports for secondary school students where up to 20% of students stated that they would truant to avoid being bullied.24 Primary school children are more likely to make up illnesses to try to stay at home rather than play truant. Health problems and staying absent from school may increase with persistent victimisation that continues into secondary school.24 Breaking the cycle of victimisation during the early primary school years before some children become chronic victims or bully/victims may help prevent persistent health, behaviour, and truancy problems. To detect bully victimisation early, health practitioners, parents, and teachers should consider bullying as a contributory factor when children present repeatedly with sore throats, colds and coughs, nausea, appetite problems, or are worried about going to school. The research was supported by grant No. R000 222563 (http://www.regard.ac.uk) from the Economic and Social Research Council (ESRC) and a primer grant of the University of Hertfordshire Faculty of Health and Human Sciences. Special thanks to Katherine Stanford and Anna Marsden who contributed to the data collection and the teachers, children, and their parents for their participation. (1993) A survey of the nature and extent of bullying in junior/middle and secondary schools. Educat Res 35:3–25. (1996) Assessment of bully/victim problems in 8 to 11 year olds. Brit J Educat Psychol 66:447–456. (1995) Bully and victim problems in elementary schools and students' beliefs about aggression. Can J School Psychol 11:153–165. (1999) Bullying in school children. in Developmental psychology. eds Messer D, Millar S (Arnold, London), pp 341–360. (2000) Twenty years' research on peer victimization and psychosocial adjustment: a meta-analytic review of cross-sectional studies. J Child Psychol Psychiatry 41:441–456. (1998) Social exclusion amongst adolescent girls: their self-esteem and coping strategies. Educ Psychol Practice 14:94–100. (1998) Bullying in schools: self reported anxiety, depression, and self esteem in secondary school children. BMJ 317:924–925. (1996) Association of common health symptoms with bullying in primary school children. BMJ 313:17–19. (1994) Bully/victim problems in middle-school children: stability, self-perceived competence, peer perceptions and peer acceptance. Brit J Dev Psychol 12:315–329. (2000) The association between physical and relational bullying and behaviour problems among primary school children. J Child Psychol Psychiatry 41:989–1002. (1998) Bullying and psychiatric symptoms among elementary school-age children. Child Abuse Negl 22:705–717. (1997) Bully/victim problems and their association with Eysenck's personality dimensions in 8 to 13 years olds. Brit J Educ Psychol 67:51–54. (1998) The relationship among bullying, victimization, depression, anxiety and aggression in elementary school children. Personality and Individual Differences 24:123–130. (1996) Children's treatment by peers: victims of relational and overt aggression. Dev Psychopathol 8:367–380. (1999) Norway. in The nature of school bullying: a cross-national perspective. eds Smith PK, Morita Y, Junger-Tas J, et al. (Routledge, London), pp 28–48. (1999) Promoting health: a practical guide. (Bailliere Tindall, Edinburgh). (1995) Follow-up of preterm children: important to document dropouts. Lancet 345:447. (1988) Statistical power analysis for the behavioral sciences. (Lawrence Erlbaum Associates, Hillsdale, NJ). (1978) Aggression in schools: bullies and whipping boys. (John Wiley and Sons, New York). (1999) Bullying and ‘theory of mind’: a critique of the ‘social skills deficit’ view of anti-social behaviour. Soc Dev 8:117–127. (1999) Social cognition and bullying: social inadequacy or skilled manipulation? Br J Dev Psychol 17:435–450. (2000) Bullying in school: are short pupils at risk? Questionnaire study in a cohort. BMJ 320:612–613. (1995) Bullying: health concerns of Australian secondary school students. Int J Adolesc Youth 5:215–224. (1995) How much does bullying hurt? The effects of bullying on the personal wellbeing and educational progress of secondary aged students. Educ Child Psychol 12:81–88.